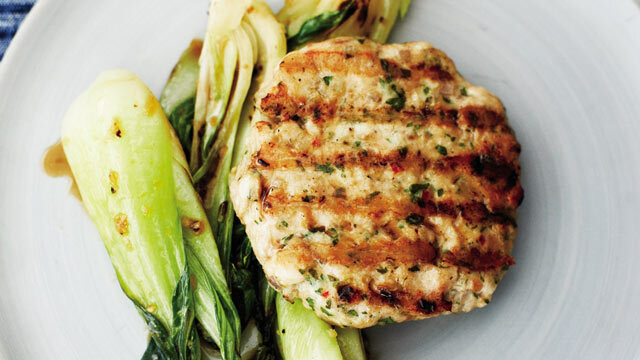 Over the weekend, I made these Thai Style Chicken Burgers with Asian Vegetables adapted from Gwyneth's latest book, It's All Good. They were delicious and make for a perfect, easy Summer dish. I made a few small changes that I noted below. Thoroughly mix the chicken with the garlic, cilantro, shallots, red chili, fish sauce, salt, and pepper. Form the mixture into 4 burgers, each about ¾ inch thick. Heat a grill or grill pan over medium heat. Rub each burger on both sides with a bit of the safflower oil and grill for about 8 minutes on the first side and another 5 minutes on the second, or until nicely marked and firm to the touch. Heat the oil in a large nonstick pan over high heat. Add the garlic and ginger and cook just until they begin to sizzle about 30 seconds. Immediately add greens along with a pinch of salt to the pan and stir to coat greens with the garlic and ginger. Add the reserved soy sauce mixture and cook just until greens begin to wilt, about 3 minutes. Serve immediately. ** I doubled the soy sauce and fish sauce along with adding leftover minced red chiles from the burgers, a few dashes of Toasted Sesame Oil, a big squeeze of lime juice, and a tablespoon of honey.